Updated: This Giveaway is now closed & the winner notified. Thanks to everyone who entered- I got a LOT of extra steps in this week! As I sit here, I have an ice bag on my ankle. The good news is that I’ve clocked 13k steps today, including a couple of miles on the treadmill! The past two weeks have driven home what a good decision signing up for the Finishline 500 Festival 5k was, versus the Mini-Marathon (there is nothing mini about it). Last week we found ourselves down one vehicle. While the van was getting serviced, our usual routines were disrupted, including my workouts. I still made it to the gym twice, but I didn’t meet my goal of five days that week (I know, who am I that that is my goal?). Saturday I did go for a walk with friends. This week I’ve gotten more miles in, but my pace is realistically a 20:0 minutes mile. Which is fine. It’s a still an actual pace, which is better than no pace at all. I’ve learned that a companion is crucial to training, as is making a date to workout. I’ve put workouts on my calendar like any other appointment, and every weekend, my friend and I figure out which days we can workout on the treadmill together. With just a week left before race day, I need to bump up my game. I’m going to have to get outside and do 5k a couple of times this coming week. As soon as I get this ice bag off my ankle! Are you needing a little motivation? Some goodies to get you moving? McDonalds and I can help! Leave a comment telling me your favorite kind of exercise, or the kind of exercise you’d like to try, and you will be entered to win a fun prize pack from McDonalds, including a t-shirt, pedometer, water bottle and a few other goodies. For additional entries, share this giveaway on social media, and leave a separate comment for each share. 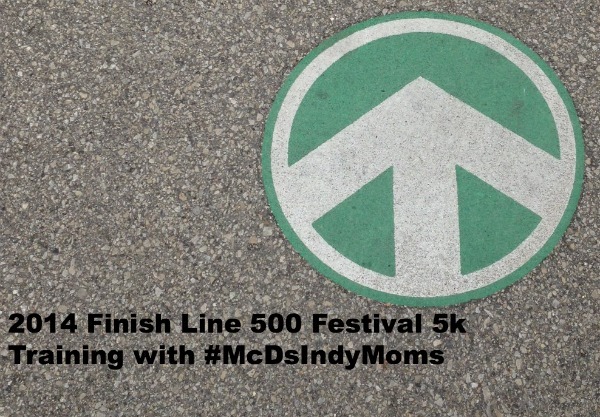 This giveaway will be open until the night before the Finish Line 500 Festival 5k. Entries will be open thru 9pm on May 2nd. Winner will have 24 hours to respond- if there’s no response, a new winner will be chosen. Good luck! Oh no, ice bag! Hope you’re ok! My fave exercise is riding my bike. I’m not competitive at it at all – I just love moving quickly without my lungs hurting the way they do when I run. I want to get back to running. There are so many fun runs out there! Sent out a tweet, too! Favorite form of exercise? I guess I’d go with running, even though I hate it at the same time. Here’s an extra thousand for ya today. Just what your wanted, right? My favorite exercise? Is probably the one that I did whatever day it is because I pretty much won’t do it if I don’t really want to. I’m working on running again, which I actually DID today. It was slow, and it hurt, but I RAN. So there. Go team. Does yoga count??? 🙂 Great job taking on a 5k! I love to trail run with my husband whenever I can! So much more fun and challenging then running on a boring street.